The Initial Coin Offering (ICO) has been so-often called a scam, hype or frenzy – but it keeps being crazily successful in funding projects. On May 31, Brave made a new ICO record with its Basic Attention Token (BAT); it sold 1.5 billion tokens for roughly $36 million – in just 24 seconds. With this, the browser has enough money to realize its vision of a better digital advertising industry. The real currency of the Internet is not bitcoin nor ether. It is attention. Clicks, visits, page views and so on. The advertising industry, the real kingpin of the Internet, tries with sophisticated algorithms and cookies to define, capture and trade this currency. The result of this is that digital advertising is dominated by intermediaries and poisoned by trackers which intrude on the user’s privacy. It is the user who pays with his bandwidth and his privacy, while the creator of websites get only a small part of the advertising revenues. The winners are those intermediaries and ad networks, which track the user’s online activity – or adblockers, which are installed on roughly 20 percent of the world’s browsers and have become a serious threat to many businesses dependent on ad revenue. 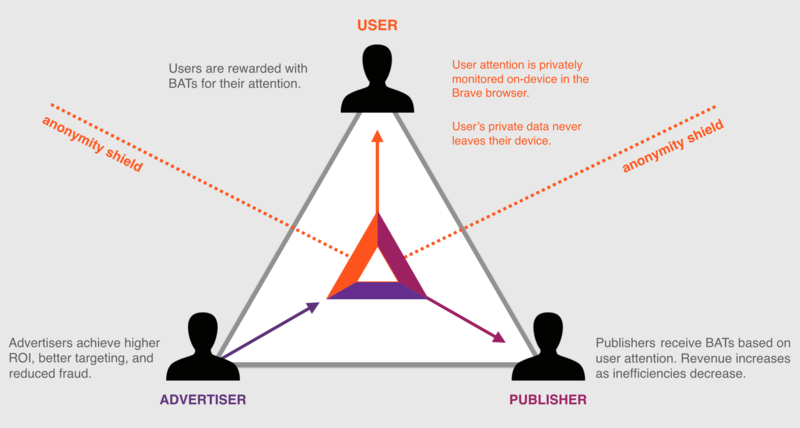 To get this right; with BAT Brave gives the users a part of the advertisement revenue. If the user only gets ten percent of the revenue, which globally sums up to about $100 billion a year, this would be one of the biggest non-governmental redistributions of wealth humankind has ever seen. It would be nearly as big as cryptocurrency itself. But even more thrilling than this is the method Brave raised funds to realize its vision of a better advertisement industry. Surely, the developers could have visited their bank officer and asked for a loan. They also could have tried to get in contact with venture capitalists and spent months begging for an investment of some hundred thousands or even millions of dollars in exchange for letting the investors influence business activity. The developers of Brave, however, decided to try a new method of fundraising; the ICO. Roughly speaking an ICO works like this; you create a business model which has something to do with cryptocurrencies or blockchains, and then you connect this business, somehow, with a token or a cryptocurrency. After this you write a whitepaper, construct a shiny website and develop a platform, on which the people can pay with ether or bitcoin for your token. That’s it. Now you can wait for the rivers of money to flow into your wallet. There is pretty much no technical reason why Brave did not use bitcoin or ether or some other existing cryptocurrency to nominate and pay out the user’s attention. An own token, however, has the advantage that the team can pre-sell the future services to investors and that those investors can hoard these vouchers for services of Brave. Compared with conventional means of project funding an ICO has several advantages; there are no banks and no fiat money involved, which makes it completely unregulated. Thanks to the unbelievable rise in the price of bitcoin and ether an ICO gives you access to a community, which has become absurdly rich and which shares the love for risky tech-investments. On top of this with an ICO you do not sell complicated finance products, but just products, which do not represent value, but contain the value in themselves. With an ICO, you eliminate a lot of bureaucracy for the issuers of the token. Since Ethereum’s smart contracts make it easy to build, store and send a huge variety of tokens, the concept ICO did not need more time than a year to become the new megatrend of fundraising. That a well done ICO is rewarded with millions of dollars is not an exception, but more like a rule. A success like the BAT’s ICO, however, is rare, even in this environment. The BAT ICO did not last longer than some seconds. It happened completely on the Ethereum Blockchain, which documents the transactions with which the tokens have been bought. The ICO began with block 3,798,640 and ended with block 3,798,642. These three blocks passed in just 24 seconds. In this short amount of time, Brave sold 1.5 billion BAT tokens. For one ether the investors got 6,400 BAT, hence the total revenue of the ICO was 156,250 ether or roughly $36 million. Originally the ICO was scheduled to last one month. But since all BAT were sold instantly, it ended in seconds. As a whole, 12,000 transactions reached out to the BAT contract address. From these, only 190 have been able to buy BAT. The rest has been rejected by the smart contract and the transfer of value has been canceled. The flood of transactions filled up Ethereum’s blocks for roughly six hours and created a backlog usually only known by Bitcoin. The popular Ethereum block explorer Etherscan was shut down because too many people refreshed it several times a second to see if their transaction finally got confirmed. The only individuals to get a chance to get their BAT were the ones who paid enough gas for their transactions. A fee market emerged. According to an analysis of Codetract.io, someone even paid 28.9 ether – about $6,600 – to get a place in a block. Most participants paid high, but sane fees. As important as the gas was the timing; whoever sent their transaction too early was rejected, as have those who sent it too late. The transactions needed to be confirmed in block 3,798,642 and its close successors. More than any other ICO, the BAT ICO was dominated by large investors. Some people managed to buy BAT for something like ten ether. But most parts of the token have been bought by ‘whales.’ The two largest investors spent more than $4 million, another two $2 million and a couple of investors around $1 million. Four investors bought around 50 percent of the token. This unequal distribution raised criticism of the ICO concept in general since the combination of timing and fees enabled a small number of investors to buy the bulk of the tokens. To counter this trend, an Ethereum developer proposed a modification of the ERC20 token code which aims to enable a more fair distribution of crowdsale token. Brendan Eich and his Brave team will likely not care. They collected a lot of money with the sale of the BAT and should be able to realize their vision of a better advertisement economy. Hopefully, they are successful with it.